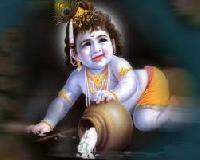 A very happy Janmashtami to everyone.Lord Krishna 8th avatar of Lord Vishnu, was born in 3112 BCE. We are now in 2013 CE. The difference between 3112 BCE and 2012 CE is 5125 years. So, this year we are celebrating the 5125th birthday of Lord Krishna.How With the help of the auspicious star formation data passed on from generations through Puranas, ancient Hindu texts and advanced planetary birth chart mapping softwares, one can predict the date Lord Krishna was born in Mathura prison. The date of His birth according to the Gregorian calendar works out to be 27th of July, 3112 BCE. 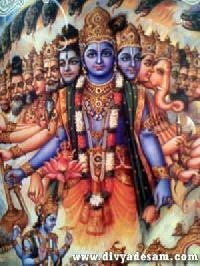 Lord Krishna appeared in a human body but he had a divine body not composed of the five elements. He did not take any birth here in the usual sense of the term. He did not die. He appeared and disappeared through His Yoga Maya as He has declared in the Gita. This is a secret, known only to His devotees, Yogis and sages. 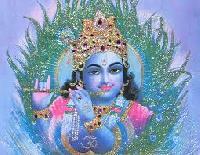 Krishna has played various roles during his stay in the world as human body. He was Arjuna charioteer. 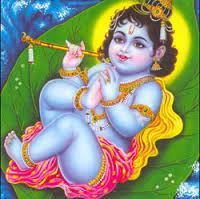 He was a master musician, the music of his flute thrilled the hearts of the Gopis and everyone else. He exhibited miraculous powers even as a child and killed many demons. He taught the supreme truth of Yoga, Bhakti and Vedanta to Arjuna and Uddhava. 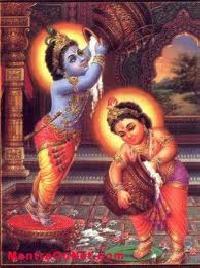 The Janmashtami celebration of Mathura and Vrindavan is special, since Sri Krishna had spent most of his life here. On this day temples and homes are wonderfully decorated and illuminated. Night long prayers are offered and religious mantras are sung in the temples. 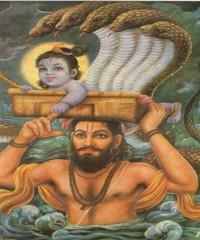 Sri Krishna was born in a prison in the custody of Kansa. Vasudev, his father immediately thought of his friend Nand and decided to hand over his child to him to save Krishna from the clutches of Kansa. Krishna grew up in Gokul and finally killed his uncle, King Kansa.